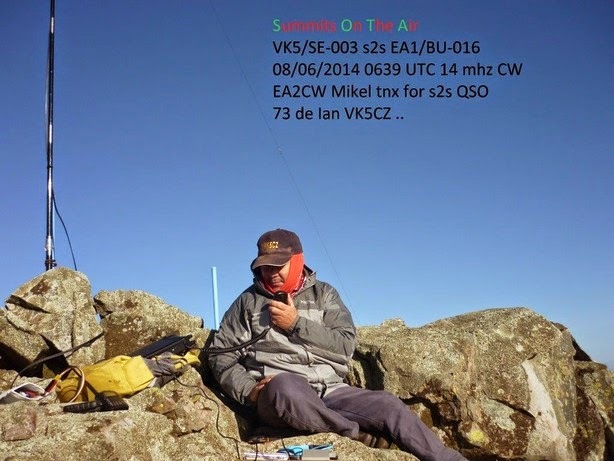 EA2CW: SOTA Trip to EA1: 7-8/6/2014 First VK-EA S2S QSO. This weekend I wanted to do some SOTA on the near regions EA1/BU and EA1/CT, as there are some summits that, given their height, are more valuable than ours. It's not easy to find 6 points summits on the EA2 association (although you go to the Pirinees or longer trips). However, the EA1 regions of Burgos and Cantabria have several 6 or more points summits closer to Bilbao. The first two, Cañoneros and Picon Blanco are quite near between them, both at north of Espinosa de los Monteros, Burgos. The three are accesible by car almost to the summit, so I could make short hikings and spend more time on each one. I was thinking on making first Cañoneros on saturday morning, going on the afternoon to Picon Blanco. Otero Mayor was an extra in case I had time to. In Picon Blanco there were some spanish military facilities, nowadays abandoned, that could give some shelter to spend the night at the summit, of course only on good weather, as the instalations are very deteriorated, and doors and windows had yet dissapeared. I have been on this summit on 2013 but the cold, heavy rain and strong winds made it a not very sweet activation. I carried a tent, and clothes enough to try again with time and better conditions. For this trip, I packed the new Norcal Doublet (7+7 meters), FT-817ND, keyer, 8Ah LiFePo4 battery, charger, and a 6 m. fishing rod, enough to set the doublet working from 28 to 10 mhz. I didnt want to work 40m, because of the noise, and the "other noise", you know. So early morning on saturday I started the trip to Cañoneros, about 1 hour from Bilbao on good roads. 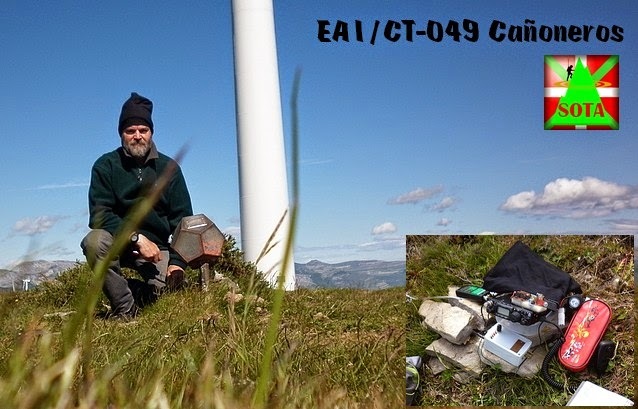 At 09:20 UTC I was already transmiting from EA1/CT-049 where I was able to make 40 QSOs on 10 and 14 mhz, and some S2S QSOs on 144mhz with 5 of the Durangoaldea SOTA Group whom were at Moncayo EA2/ZG-001: Iratxe EA2DNO, Alberto EA2DCA, Alberto, EA2DYS, Gotzon EA2CSC and Roberto, EA2DXY, all of them very active as SOTA activators, making a lot of summits on EA2/BI, SS, and NV mainly. Later I contacted on 14 mhzwith EA2BSB/P who was at EA2/NV-105. I left the summit 1 hour later. Not very long staying, but I wanted time enough to arrive not too late to Picon Blanco. After arrival to Picon Blanco at noon, I met there Hipolito EA2DR and Iñaki EB1RL. They were preparing a weekend long V-UHF contest. They use to setup some big antennas on this summit, but due to the very strong wind, they only used a 12 el 144 yagi and something similar on 432. Nothing to do with SOTA rigs: generators, rotors, linears... they had arrived with three cars full of material. As I had no intention of working up from 28 mhz, there weren't be any trouble among us. I chose to set mine at about 200 meters on a small guard-house. A palace for a SOTA activator. There I spent two hours on 10 and 14 mhz both on SSB and CW, making several EU S2S contacts. Later, I was with Hipolito and Iñaki, watching them while operating, and talking a lot about radio, of course. Finally, and as I thought that the weather was good enough to stay at night, I mounted the tent inside of one of the buildings, leaving almost all ready for an early activation on sunday. That way it was. I didn't sleep very well, as the temperature was not ideal and the floor was as hard as it uses to be. But next morning, at 06:30 UTC I was already transmiting CW on 14 mhz and just 6 minutes later, came the surprise. I was able to listen Ian VK5CZ at VK5/SE-003, faint, but we made the first QSO summit to summit between EA and VK. Wow! As it was made by the long path (if you want, you can see the analysis at this page), It could be one of the longest summit to summit QSO on the SOTA history, about 23500 km long, and just with 8 watts on my side and about 25 w. on Ian's! Just for this QSO, the trip was worth it! I can't explain how I was able to keep on with the activation one hour more, but I did. After some jumping, shouting, texting and so around the summit, I packed all it ready for going to the last summit of the weekend. I said goodbye to the VHF'ers that were making pretty well, and started the two hours trip to Otero Mayor EA1/BU-050. But the weekend has been already made. Another easy hike to the summit, where the eolic generators caused severe RF noise on almost all the HF bands. 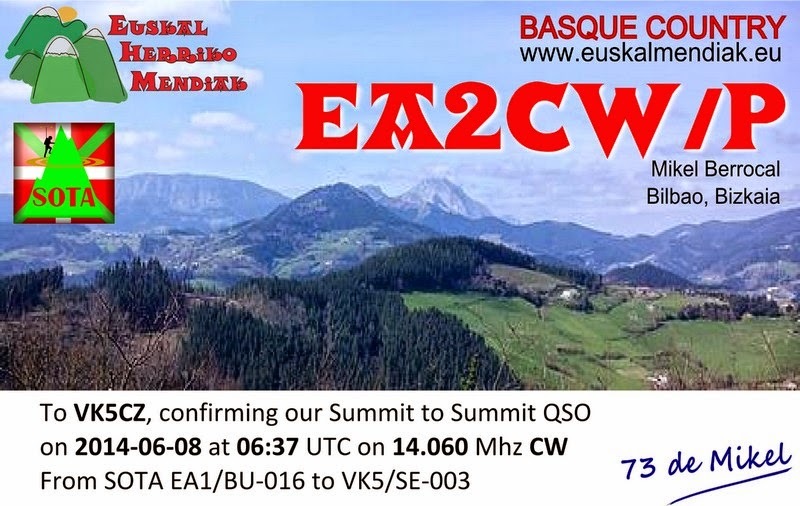 But despite of the noise I was able to make 32 QSOs more on 7, 10 and 14 mhz CW and SSB, including 6 more S2S QSOs, one of them with Marcial EA2BDS who was at Gorbeia (our favourite mountain) and ending all it at 11:30 UTC. It was time to eat something serious, and to start the way back home. Not bad at all, and a weekend to remember, indeed!